The K3 is probably the best choice when going for digital modes of all shapes and sizes. If you are having problems getting your station on the air take a look at my setup and you may figure out whats wrong. The K3 is hooked up to the computer via the serial to USB cable. In my experience, keying the K3 via CAT is far superior than using VOX. Plus it gives you the safety of only keying the radio when the software wants it keyed vs having every windows sound effect (and YouTube video!) sounds being piped over 20M because you forgot to turn VOX off. 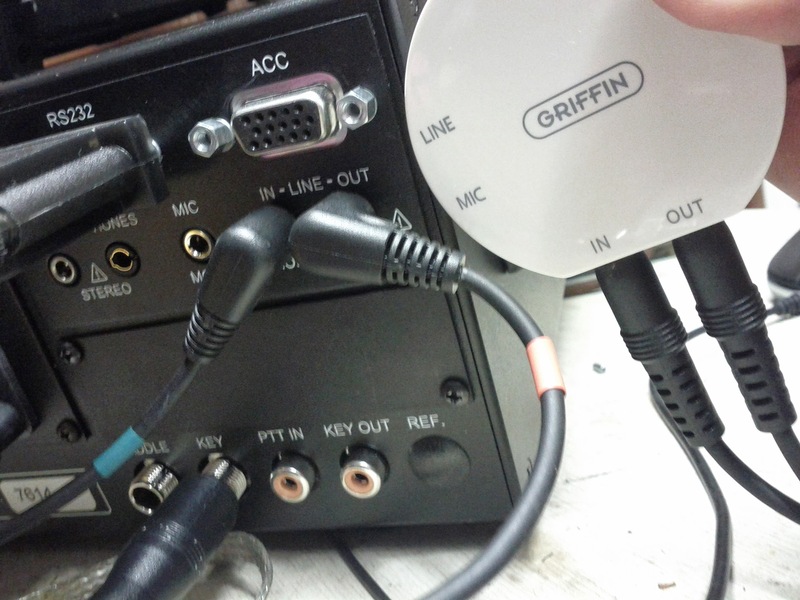 From the K3, I hook audio cables up to a Griffin iMic USB sound card. They run about 20-30 dollars and use generic USB audio drivers so they are supported on every platform. The setup is pretty simple, out to in and in to out. I use the Elecraft cable set (KX3-PCKT) that is a KX3 option just because the shielded cables are high quality, and since I own a KX3 it comes with the breakout box for external keying, etc. Put the K3 in Data mode, and set the sub-mode to DATA-A. This (by default) will transmit on USB. If you enable REV, it’ll transmit on LSB (like for RTTY). On the software side, its important to set your levels so the ALC meter has 4 solid bars and the 5th bar flickers. Thats the ideal transmitting spot for the K3. I know that it looks like you’re cranking the ALC up, but really you arent. I usually use FLDigi and hit the TUNE button so I get a constant carrier. You can do a few things to increase the audio going to the K3. You can turn up the mic gain on the front panel, or you can adjust your soundcard mixer volume up or down. Once you get your ALC levels where you want them, you wont have to touch them if you go up or down in power (unlike some rigs like my ICOM). Once you have all this setup, you are ready go do some digital! This entry was posted in Amateur/Ham Radio and tagged digital modes, Elecraft, ham radio, K3. Bookmark the permalink.